Any seriously thinking and concerned native Filipino will note that the dominant orthodoxy is globalization aka neoliberalism supposedly for us to economically catch-up , to attain economic/material progress --for an underdeveloped country like ours. Any young native Filipino who takes a course in political economy aka economic development essentially obtains exposure typically and solely in the gospels of Adam Smith and David Ricardo, i.e. the "market system" with its "invisible hand," and "comparative advantage," respectively. They are the gospels of the currently dominant economic thinking or orthodoxy that are preached as THE only way to progress for less-developed countries (LDC) or underdeveloped countries like our homeland to escape poverty, to making economic miracles, to better standard of living. To the knowledgeable native Filipino, he knows that our technocrats were early signatories to the secretive agreements/negotiations with the WTO and its trading rules (replacing the GATT) -- the organization created in 1995 by the rich countries led by the G7 club and enforced by the IMF and WB combo which ostensibly were founded after World War II to help the poor countries towards development. With their signing, for our homeland and people, the subsequent 14 years till the present were; and, in the foreseeable future shall be, full of the same punishments: deeper, greater and wider impoverishment for our fellow native Filipinos in the homeland. All these punishments will be endlessly worsening for the born and unborn generations unless native Filipinos in the homeland become wholly educated, raise their nationalist consciousness, understand and become united to act against our fellow native technocrats, rulers and with their foreign partners/sponsors ( resident foreigners and transnational corporations (TNCs) who maintain and spread lies and who obviously have much to gain from our dumbing down and resultant massive ignorance and disunity. Below is an eye-opening article, a recent find including its highly regarded and influential Korean author Ha-Joon Chang, a Professor and Director (specializing in) of Developmental Economics at the University of Cambridge (England). I have just started reading his works and have found his factually-based analytical writings highly recommendable to those who seriously want to learn and understand the truth about economic history in the Western world and the Asian economic miracles of recent decades; and compare where our homeland and our people are after religiously following and doing what our Americanized minds dictated. There is currently great pressure on developing countries to adopt a set of “good policies” and “good institutions” – such as liberalisation of trade and investment and strong patent law – to foster their economic development. When some developing countries show reluctance in adopting them, the proponents of this recipe often find it difficult to understand these countries’ stupidity in not accepting such a tried and tested recipe for development. After all, they argue, these are the policies and the institutions that the developed countries had used in the past in order to become rich.Their belief in their own recommendation is so absolute that in their view it has to be imposed on the developing countries through strong bilateral and multilateral external pressures, even when these countries don’t want them. Naturally, there have been heated debates on whether these recommended policies and institutions are appropriate for developing countries. However, curiously, even many of those who are skeptical of the applicability of these policies and institutions to the developing countries take it for granted that these were the policies and the institutions that were used by the developed countries when they themselves were developing countries. Contrary to the conventional wisdom, the historical fact is that the rich countries did not develop on the basis of the policies and the institutions that they now recommend to, and often force upon, the developing countries. Unfortunately, this fact is little known these days because the “official historians” of capitalism have been very successful in re-writing its history. Contrary to the popular myth, Britain had been an aggressive user, and in certain areas a pioneer, of activist policies intended to promote its industries. Such policies, although limited in scope, date back from the 14th century (Edward III) and the 15th century (Henry VII) in relation to woolen manufacturing, the leading industry of the time. England then was an exporter of raw wool to the Low Countries, and Henry VII for example tried to change this by taxing raw wool exports and poaching skilled workers from the Low Countries. Particularly between the trade policy reform of its first Prime Minister Robert Walpole in 1721 and its adoption of free trade around 1860, Britain used very dirigiste trade and industrial policies, involving measures very similar to what countries like Japan and Korea later used in order to develop their industries. During this period, it protected its industries a lot more heavily than did France, the supposed dirigiste counterpoint to its free-trade, free-market system. Given this history, argued Friedrich List, the leading German economist of the mid-19th century, Britain preaching free trade to less advanced countries like Germany and the USA was like someone trying to “kick away the ladder” with which he had climbed to the top. List was not alone in seeing the matter in this light. Many American thinkers shared this view. Indeed, it was American thinkers like Alexander Hamilton, the first Treasury Secretary of the USA, and the (now-forgotten) economist Daniel Raymond, who first systematically developed the "infant industry" argument. Little known today, the intellectual interaction between the USA and Germany during the 19th century did not end there. The German Historical School – represented by people like Wilhelm Roscher, Bruno Hildebrand, Karl Knies, Gustav Schmoller, and Werner Sombart – attracted a lot of American economists in the late 19th century. The patron saint of American Neoclassical economics, John Bates Clark, in whose name the most prestigious award for young (under 40) American economists is given today, went to Germany in 1873 and studied the German Historical School under Roscher and Knies, although he gradually drifted away from it. Richard Ely, one of the leading American economists of the time, also studied under Knies and influenced the American Institutionalist School through his disciple, John Commons. Ely was one of the founding fathers of the American Economic Association; to this day, the biggest public lecture at the Association’s annual meeting is given in Ely’s name, although few of the present AEA members would know who he was. Between the Civil War and the Second World War, the USA was literally the most heavily protected economy in the world. In this context, it is important to note that the American Civil War was fought on the issue of tariff as much as, if not more, on the issue of slavery. Of the two major issues that divided the North and the South, the South had actually more to fear on the tariff front than on the slavery front. Abraham Lincoln was a well-known protectionist who cut his political teeth under the charismatic politician Henry Clay in the Whig Party, which advocated the “American System” based on infrastructural development and protectionism (thus named on recognition that free trade is for the British interest). One of Lincoln’s top economic advisors was the famous protectionist economist, Henry Carey, who once was described as “the only American economist of importance” by Marx and Engels in the early 1850s but has now been almost completely airbrushed out of the history of American economic thought. On the other hand, Lincoln thought that African Americans were racially inferior and that slave emancipation was an idealistic proposal with no prospect of immediate implementation – he is said to have emancipated the slaves in 1862 as a strategic move to win the War rather than out of some moral conviction. In protecting their industries, the Americans were going against the advice of such prominent economists as Adam Smith and Jean Baptiste Say, who saw the country’s future in agriculture. However, the Americans knew exactly what the game was. They knew that Britain reached the top through protection and subsidies and therefore that they needed to do the same if they were going to get anywhere. Criticising the British preaching of free trade to his country, Ulysses Grant, the Civil War hero and the US President between 1868-1876, retorted that “within 200 years, when America has gotten out of protection all that it can offer, it too will adopt free trade”. When his country later reached the top after the Second World War, it too started “kicking away the ladder” by preaching and forcing free trade to the less developed countries. The UK and the USA may be the more dramatic examples, but almost all the rest of the developed world today used tariffs, subsidies and other means to promote their industries in the earlier stages of their development. Cases like Germany, Japan, and Korea are well known in this respect. But even Sweden, which later came to represent the “small open economy” to many economists had also strategically used tariffs, subsidies, cartels, and state support for R&D to develop key industries, especially textile, steel, and engineering. There were some exceptions like the Netherlands and Switzerland that have maintained free trade since the late 18th century. However, these were countries that were already on the frontier of technological development by the 18th centuries and therefore did not need much protection. Also, it should be noted that the Netherlands deployed an impressive range of interventionist measures up till the 17th century in order to build up its maritime and commercial supremacy. Moreover, Switzerland did not have a patent law until 1907, flying directly against the emphasis that today’s orthodoxy puts on the protection of intellectual property rights (see below). More interestingly, the Netherlands abolished its 1817 patent law in 1869 on the ground that patents are politically-created monopolies inconsistent with its free-market principles – a position that seems to elude most of today’s free-market economists – and did not introduce another patent law until 1912. The story is similar in relation to institutional development. In the earlier stages of their development, today’s developed countries did not even have such “basic” institutions as professional civil service, central bank, and patent law. It was only after the Pendleton Act in 1883 that the US federal government started recruiting its employees through a competitive process. The central bank, an institution dear to the heart of today’s free-market economists, did not exist in most of today’s rich countries until the early 20th century – not least because the free-market economists of the day condemned it as a mechanism for unjustly bailing out imprudent borrowers. The US central bank (the Federal Reserve Board) was set up only in 1913 and the Italian central bank did not even have a note issue monopoly until 1926. Many countries allowed patenting of foreign invention until the late 19th century. As I mentioned above, Switzerland and the Netherlands refused to introduce a patent law despite international pressure until 1907 and 1912 respectively, thus freely “stole” technologies from abroad. The examples can go on. One important conclusion that emerges from the history of institutional development is that it took the developed countries a long time to develop institutions in their earlier days of development. Institutions typically took decades, and sometimes generations, to develop. Just to give one example, the need for central banking was perceived at least in some circles from at least the 17th century, but the first “real” central bank, the Bank of England, was instituted only in 1844, some two centuries later. Another important point emerges is that the levels of institutional development in today’s developed countries in the earlier period were much lower than those in today’s developing countries. For example, measured by the (admittedly highly imperfect) income level, in 1820, the UK was at a somewhat higher level of development than that of India today, but it did not even have many of the most “basic” institutions that India has today. minimal labour regulations (except for a couple of minimal and hardly-enforced regulations on child labour). If the policies and institutions that the rich countries are recommending to the poor countries are not the ones that they themselves used when they were developing, what is going on? We can only conclude that the rich countries are trying to kick away the ladder that allowed them to climb where they are. It is no coincidence that economic development has become more difficult during the last two decades when the developed countries started turning on the pressure on the developing countries to adopt the so-called “global standard” policies and institutions. During this period, the average annual per capita income growth rate for the developing countries has been halved from 3% in the previous two decades (1960-80) to 1.5%. In particular, Latin America virtually stopped growing, while Sub-Saharan Africa and most ex-Communist countries have experienced a fall in absolute income. Economic instability has increased markedly, as manifested in the dozens of financial crises we have witnessed over the last decade alone. Income inequality has been growing in many developing countries and poverty has increased, rather than decreased, in a significant number of them. First, the historical facts about the historical experiences of the developed countries should be more widely publicized. This is not just a matter of “getting history right,” but also of allowing the developing countries to make more informed choices. Second, the conditions attached to bilateral and multilateral financial assistance to developing countries should be radically changed. It should be accepted that the orthodox recipe is not working, and also that there can be no “best practice” policies that everyone should use. Fourth, improvements in institutions should be encouraged, but this should not be equated with imposing a fixed set of (in practice, today’s – not even yesterday’s – Anglo-American) institutions on all countries. Special care has to be taken in order not to demand excessively rapid upgrading of institutions by the developing countries, especially given that they already have quite developed institutions when compared to today’s developed countries at comparable stages of development, and given that establishing and running new institutions is costly. Ha-Joon Chang (hjc1001@econ.cam.ac.uk) teaches in the Faculty of Economics, University of Cambridge. 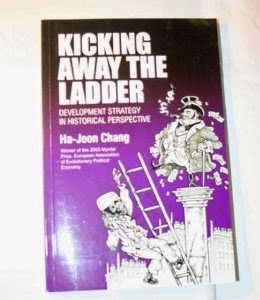 This article is based on his new book, Kicking Away the Ladder – Development Strategy in Historical Perspective, which was published by Anthem Press, London, on 10 June 2002. Ha-Joon Chang, “Kicking Away the Ladder,” post-autistic economics review, issue no. 15, September 4, 2002, article 3. Bert, thank you for the info. It is a confirmation of my own observations and studies on the local scene, and limited [I have to be honest] international scene. I say again, globalization is a racket of the rich and developed countries that have apparently been running out of markets since Japan started its "high quality" war in the late seventies and early eighties against its competitors. Japan master-fully turned its competitors' free trade policies against them. The bombardment was followed by neighboring Asian countries that have learned the tricks. In the current decade China has become the free trade practitioners' nemesis. What I suspect, if only a learned researcher would do his thing well, the past global financial difficulties were all "free trade" and "decreasing market" related. I have this sneaky suspicion that the capitalists are running out of market space and making up excuses and desperate measures to correct themselves, but unfortunately to no avail. I have been seeing signs of it, but since my world market, manufacturing and economics histories are very much wanting, I could not really put my finger on it. Call it coming from the sixth sense, I feel it in the very marrows of my bones. In the advent of super quick info gathering and advanced individual researches, knowledge to make new things and "doing or making the better way" have destroyed the Western monopoly on competitive manufacturing and even creative marketing. Indeed knowledge is power. When everyone gets to know how to make things and able to market them, competition which is the operative mechanism of the market. will decrease or eventually stop, and as a consequence so will the market. No competition, no business activity, no market, no more capitalism. Monopolies may be an exception but they don't work in the truly free market these days where everyone can claim to have the knowledge to compete and be a competitor. :But capitalism must survive by all means" agree all the G-7 countries and the 20 most advanced economies who recently met to decide on how best to "protect themselves" under the present financial crisis. Vatican can't help but side with the capitalists because it has a long time ago endorsed capitalism as the best way to advance toward the better life [not necessarily the good life]. Tiny Philippines must chart its own course. But how to do it when it cannot think independently; when all it does is "slave-follow" the dictates of its capitalist masters? To do it is to be truly "knowledgeable;" know as much [more is desirable] than the capitalist masters. That is the only way. We cannot get away from the dictum "knowledge is power." Knowledge will lead to true independence, justice, peace and development that our slaved-country desperately needs. Bert, I need to confer upon you, a medal of recognition :), for taking the pains to give us info that will make us truly knowledgeable so that one day soon we may be empowered, proudly independent, and able to chart our future exactly in the direction where destiny and God want us to go. Imperialism continues simply by the political capture of weak states strategic institutions that regulate finance, trade and so called national currencies. The Filipino is still a very superficial and artificial cultural construct who does not have a soul for country. I agree with you that by capturing the Filipino minds that work, operate and control the various institutions in our homeland. Neoimperialism [aka neoclassical liberalism aka globalism]has profited extremely well for the foreign transnationals (TNCs -who in turn essentially now control/use their governments) and their native, partners. Protectionism is a government/official policy designed to protect native, infant industries, native businesses until they flourish and face the world so to speak. It can be used whether one is following communist, socialist, capitalist or mixed economy. The bottom raison d'etre is to develop a strong national agriculture and industry before anything else. 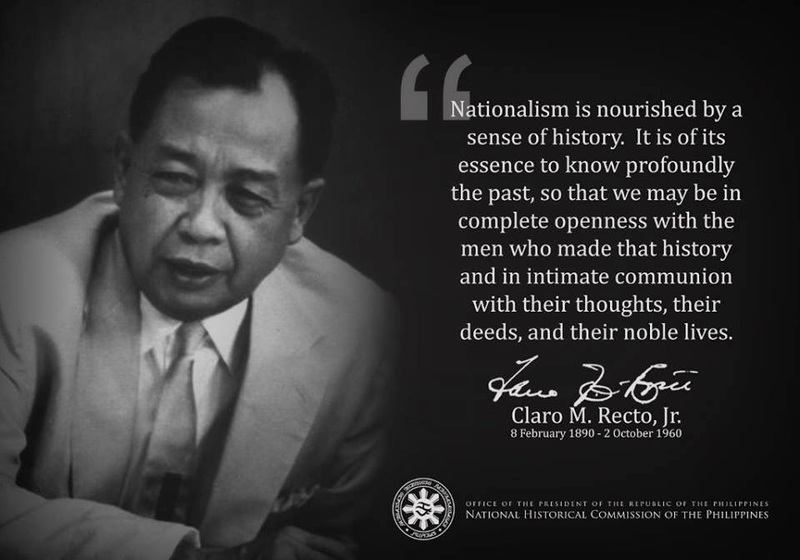 And the strongest motivation and action for such would be a strong Filipino nationalism. Our homeland has enough bright and entrepreneurial minds but our government has historically been/is inhabited and controlled by collaborators who serve foreign interests, including economic interests. We have lost so much time and opportunities that it is extremely difficult to "catch up." But it is attainable if we could make changes in our mindset towards nationalism; to have a resurgence of nationalism among our native majority which would pressure our rulers to work and have the balls to implement necessary radical changes for the common good. In economic matters, it means nationalist industrialization and agriculture to serve the domestic demand, it means to strongly and firmly renegotiate our foreign debt, including those that are essentially odious debts. It means to be ready to fight and sacrifice for the sake of the future generations of Filipinos. With mass nationalism, foreign intervention will not prevail.